Here’s how you can find gold in Scotland. Yes, really. “There’s gold in them thar hills,” said Mark Twain’s character, Mulberry Sellers, referring to the great California Gold Rush of 1849. Several thousand miles away and around 20 years later, others were making the same remark, but in a Highland twang, when there was another gold rush, this time in Kildonan, Scotland. It was sparked after prospector, Robert Gilchrist, who had returned home to the Highlands from Australia, discovered gold in the Kildonan Burn, near Helmsdale. After a newspaper reported gold had been found, news spread like wildfire and hundreds of men, from all over the country, flocked to the Sutherland area in search of the precious, glistening metal. By April of that year, a hastily built village called Baile an Or – Gaelic for Town of Gold – was erected around the stretch of burn in which the gold was found, where it’s thought as many as 600 men lived, but the weather did little for their enthusiasm and all but the most determined to strike it rich left within a few weeks. Those who stayed, however, managed to find worthwhile deposits of gold and soon converted their improvised tents into permanent shelters, but as soon as a township began to take shape, the Duke of Sutherland, who owned the land, began issuing licences and placing heavy financial demands on the miners. The wooden shacks that provided homes for the prospectors are long gone but visitors can still try their hand at panning for gold in the area, and according to gold mining expert Vince Thurkettle, spring is one of the best times to pan for gold in Scotland. His aim has never been to find gold in order to get rich quick, it’s the hunting aspect of it he loves, but because of its rarity, Scottish gold is definitely worth getting your hands on. “The first time I went to sell a bit of Scottish gold I was offered around 10% above the then market price, but now I think it’s worth double the world price because it’s very hard to find,” said Vince, 60. As a young man, he was gripped by gold fever and since then has spent nearly 40 years, much of it in Scotland, panning for the elusive mineral. “I thought searching for gold had all finished in the Victorian era and didn’t realise you could still do it. I was training to be a forester but interested in geology and one night, while out looking for minerals, met a gold prospector who showed me some gold he’d found, and told me how and where to find it. “All of a sudden my interest in all other metals just fell away. I was gripped by gold fever and that became a critical turning point in my life,” said Vince who donated gold he’d found for the Scottish mace, presented by Her Majesty The Queen at the opening ceremony of the Scottish Parliament, in 1999. He is not, as some may think, always on the look out for one big nugget that would change his life. to me it’s a treasure hunt with nature. It’s being outdoors, the lifestyle and the people you meet is what it’s really all about. “There’s never been a silver rush, platinum rush, diamond or sapphire rush but there have been gold rushes because there is something special about gold. The amount people find varies greatly and he feels that in the world of gold panning people generally exaggerate, either up or down, about how much they’ve found. “I’ve found enough to keep me interested but not enough to make a living so in the winter I grow Christmas trees, and run gold panning courses – and I’ve written a book on firewood. Gold is a big part of my income but I couldn’t live off prospecting alone,” said Vince who has been described by his mother as an adventurer who is out of his age. “After panning for gold for 20 years I was asked if I went prospecting in new areas and always said no because I felt the British Isles had been prospected since the Bronze Age so there was nothing new to find. But I was wrong. “Over the last 20 years there’s a lot of lads, some who are possibly out of work and others genuinely interested in finding gold, who have gone prospecting and found sites which are not recorded where the gold was good. I consider Scotland the King of Gold because of the geology, old rocks and faults such as the Great Glen. Areas where natural gold occurs in Scotland include Sutherland, Stirling, Perthshire, Dumfries and Galloway and Lanarkshire. In Sutherland, a gold-panning kit comprising a pan, riddle and hand trowel can be hired for £5 a day from Strath Ullie Crafts & Visitor Information by Helmsdale Harbour. Panning is restricted to selected areas and digging must be kept to the centre and sides of the burn, to avoid under mining of the banks. Any holes must be backfilled for the safety of other users. “In the old days looking for gold was relatively straightforward but one or two people have got carried away and think they’re in the Klondike and dig big holes and make a mess. But they can’t do this. Our wildlife and open spaces are special. Earlier this year, the Press and Journal reported that gold mining could be up and running at Cononish in Argyll, in a few months time. Scotgold Resources, the company behind the project saw its share price soar by more than 13% after it announced that, subject to planning permission, a “bulk processing trial” (BPT) was just months away. It expects about 2,400 tonnes of a gold-rich stockpile would be processed over the six-month trial period. Early discussions indicate that the Scottish mined gold produced from the trial can be sold at a significant premium and it is anticipated that around 150oz of gold bullion will be produced at the Cononish site and up to a further 350oz from off-site processing of concentrates. Vince is delighted at the prospect of full-scale gold mining happening once more in Scotland. “I think it’s wonderful because all the environmental issues would have been considered and all the safeguards put in place. 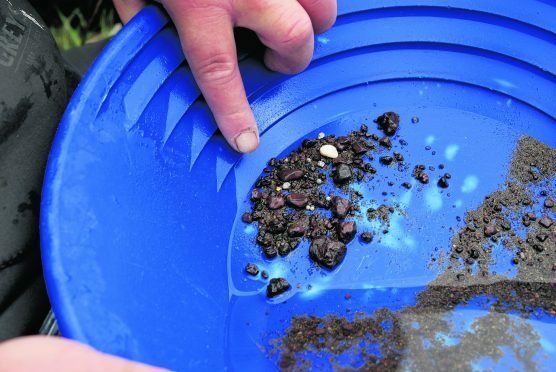 Meanwhile, another company searching for gold in Aberdeenshire recently doubled the size of its prospecting area after uncovering rock laden with the precious metal. GreenOre Gold, which is backed by Turkish gold mining giant Koza Altin Isletmeleri, has now licensed nearly 200 square miles of land after finding significant gold samples in the rocks and streams surrounding Alford, Rhynie and the tiny village of Towie last year. As for the dream many share of finding gold on their own land? “I think if you find a few specs or grams you were going to use for yourself that’s fine but if you planned to sell it I’d suggest talking to the Crown Commissions just to see if you need to set up a Royalty agreement,” said Vince. Stay switched on to extreme weather events. Master the gold pan and metal detector. Learn to recognise natural and manufactured gold.